How to care for leather jackets? For the purpose of this article, there are two categories of leather (A) Porous leathers—lamb skin, sheepskin, etc. (B) Non-porous—mostly cattle. While leather is always porous to some degree, some leathers remain particularly porous and “absorbent”. A drop of water on a light color leather jacket may instantly produce a dark spot while on a less porous leather, it will evaporate before ever penetrating leather. The method is the same for porous and non-porous leather. Only the quantity of each product used is varied. How to care and condition leather jackets? • Read this article from top to bottom. • Evaluate if cleaning is needed. • Evaluate if you need to cover up the buttons. HOW TO CONDITION AND CARE FOR YOUR LEATHER JACKET? If needed clean leather with Aquila. Spray and wipe gently using a lint-free soft cloth. Do not scrub. Repeat if needed. Leave to dry. To facilitate mixing, shake the URAD jar until the product liquefies. Then for A) Porous leather: Mix 3/4 Tenderly for 1/4 URAD. And for B) Non-porous leather: Mix 1/2 Tenderly and 1/2 URAD. The lighter the color and the more porous your leather is, the more TENDERLY is used. A white lambskin jacket might be treated with 9/10 TENDERLY and only 1/10 URAD, if any. Test in a small hidden area first. Once you are satisfied with your test, apply with the applicator sponge provided, gently rubbing it in without scrubbing. This conditioning should be repeated once or twice a year. You can add a few drops of Costa Brava dye if the color is only slightly faded or if the color did not restore using URAD neutral as above. Otherwise, for very badly damaged or faded color read this leather jacket restoration article. - URAD contains Lanolin, the best moisturizing oil for leather. It helps restore faded color. It may darken light colored porous leather. - URAD contains natural carnauba wax that protects and gives a natural shine. Wax may not dry well on very porous leather so it may remain tacky even after normal dry time. On extremely Non porous leather, wax may sit on the surface of leather and white marks may show up in the thin wax surface layer when you move the leather. Both of these conditions can be alleviated or completely handled by mixing URAD with Tenderly as described above. - TENDERLY moisturizes, softens and was designed to condition any leather that does not put up with oil or wax. However, it offers only minimum protection, it does not restore color and does not shine. It helps spread URAD thin and helps soften the protective carnauba wax layer. Mixing Urad and Tenderly in various degrees usually provides the best result for leather jackets and apparel. The above method provides enough protection, and is normally done twice a year. Yet there are situations where it would be wise to invest more on protection. A good candidate for this would be a white or very light color lambskin jacket. Protecting it well, right from the start, would make it much easier to maintain and condition later. Whenever more protection is needed, apply SAHARA: preferably outdoors or in a well-ventilated area and preferably wearing a mask, spray 1 or 2 thin layers of Sahara on the jacket. Hang to dry for 8 hours without moving the jacket (for each layer). For thick leather that may have hardened or be stiff, use a light coat of GRASSO and let it penetrate a few hours. Repeat if needed. Wipe off any excess oil that did not fully penetrate, then apply a thin coat of Tenderly (3/4) - Urad (1/4) mixture. GRASSO contains oils and may darken leather. Don’t worry about exact quantity. A little more URAD or TENDERLY will not make a huge difference. Quantity of product needed will vary widely, depending on the type of leather, the size of the jacket and how much product it absorbs. Every leather article is unique in terms of the raw materials, tanning methods and products employed in its manufacturing; we recommend a test always be made on a less visible part of the article first. If color is only slightly faded, add a few drops of COSTA BRAVA (or a little URAD with Color) to the URAD-TENDERLY mixture. But if the color is badly faded use the restoration method. Leather is a very noble, comfortable and beautiful material that has incredible longevity, provided it is well cared for! 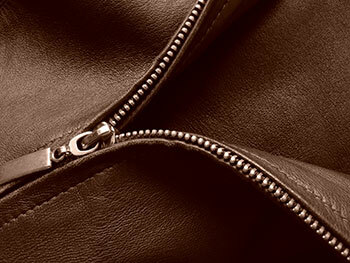 These simple steps should help you enjoy all your leather clothing for many years!